^ Ostler, Edward (1982). History of the Cornwall Railway 1835-1846. Weston-super-Mare: Avon-Anglia. ISBN 0-905466-48-9. ^ Norrie, Charles Matthew (1956). 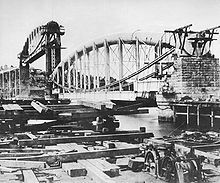 Bridging the Years - a short history of British Civil Engineering. Edward Arnold (Publishers) Ltd.
^ a b c d e f g h i Binding, John (1997). Brunel's Royal Albert Bridge. Truro: Twelveheads Press. ISBN 0-906294-39-8. ^ a b MacDermot, E T (1931). History of the Great Western Railway, volume II 1863-1921. London: グレート・ウェスタン鉄道. ^ a b Bennett, Alan (1990). The Great Western Railway in East Cornwall. Cheltenham: Runpast Publishing. ISBN 1-870754-11-5. ^ “Illustrated Railway Supplement”. West Briton & Cornwall Advertiser (2547). (1859). ^ Murray, John (1859). Murray's Handbook for Devon and Cornwall. London: John Murray. ISBN 0-7153-5293-8. ^ Perry, George (editor) (1970). 'The Book of the Great Western. London: Sunday Times Magazine. ISBN 0-7230-0018-2. ^ Mais, SPB (3rd ed. 1934). The Cornish Riviera. London: グレート・ウェスタン鉄道.